Hey guys. 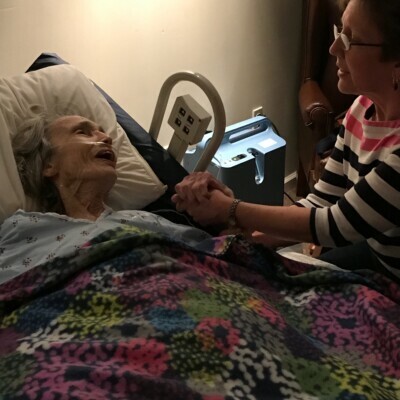 I’ve been itching to share this video and post with you for so many reasons. Kick back (for like 3 minutes) and give it a watch. Then read on for more info! As I mentioned in the video, I’m in this stage of life in which errands are not easy. In fact, errands are WORK. 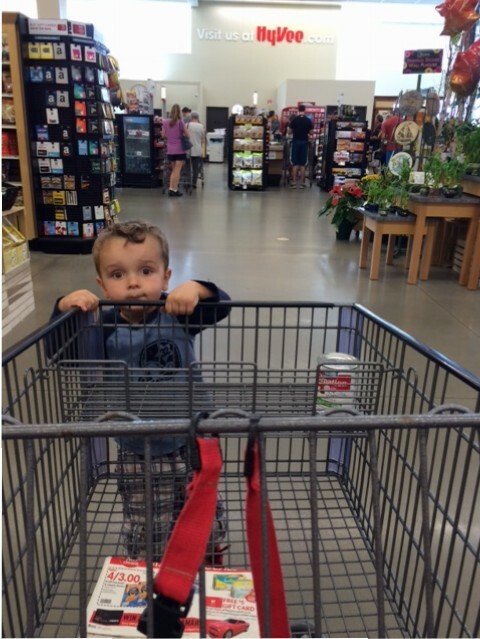 When my kids were younger–like infant and toddler age–errands, particularly the grocery store, had to be properly timed between naps and nursings. Not to mention the ridiculous amount of things you had to bring along for a “just in case” scenario. If you miss that 30 minute window of the day where nobody has a primary need, a trip to the store is a nightmare. Now, with a 2 and 4 year old, I have a different type of preparation for the store. A mental preparation. I have to jazz myself up to be kind, firm, patient, disciplined, agile (yes, agile) and extremely efficient. No backtracking. No innocent browsing. 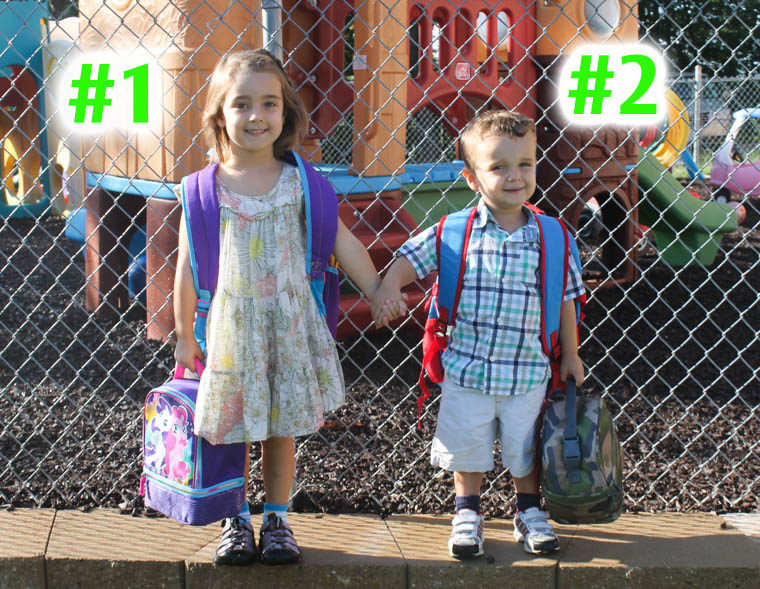 Parents of littles- you know what I’m talking about. Idle hands are the devils workshop. Especially at the grocery store. Oftentimes, when I leave the grocery store I seriously feel like I’ve gone through some sort of obstacle course. Even though I stay at home with my kids, I sometimes just don’t have time to go to the store. We stay busy and taking a morning to go to the store means saying no to something else we could be enjoying together. So in this crazy, busy, sometimes-stressful season of life, here is a dream of mine. In my perfect world, my groceries would show up at my doorstep. OR I’d even be OK with them waiting for me in their bags AT the store. I’m not picky. I just don’t want to chase my herd of kittens through the bakery anymore. Seems far-fetched. Yes, I know. Well, friends. Dreams do come true. 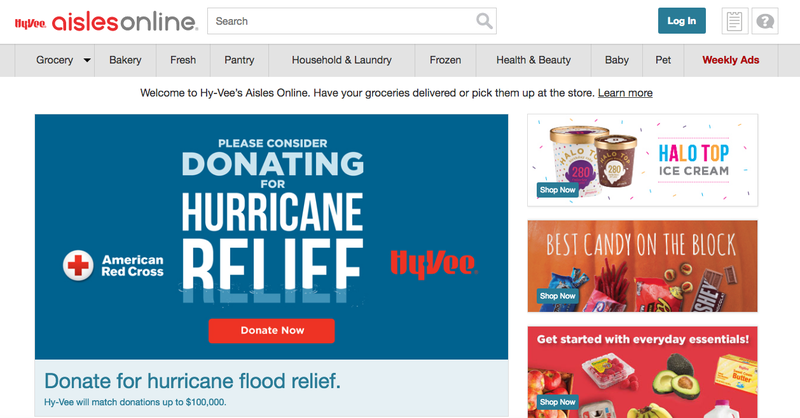 My favorite local grocery store in Columbia, HyVee, is now offering online shopping delivery or pickup. AND if you spend over $100 (what family doesn’t?) it is FREE. Free indeed. I repeat. 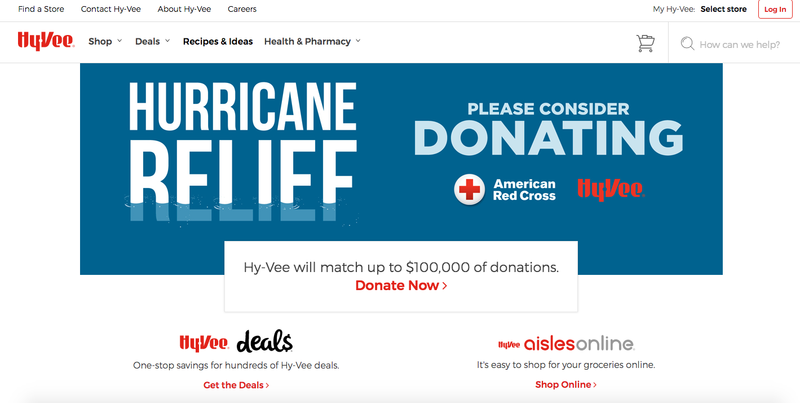 HyVee will deliver your hand-picked groceries to your home for free if your order is over $100. If it is under that, there is only a $4.95 delivery charge. That’s it. First things first. Make a menu plan for the week. 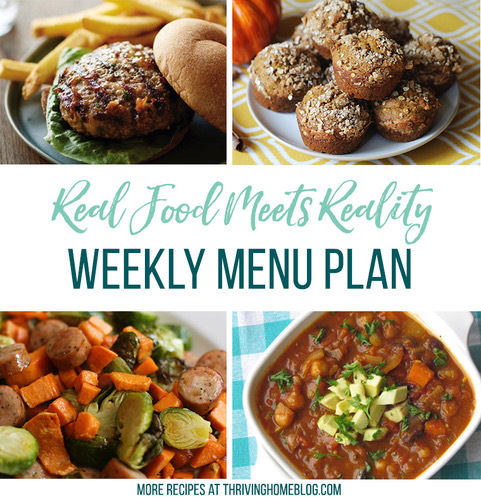 To make this super easy for you, we create weekly menu plans that actually plan meals and recipes around the sales at HyVee. Here is an example of one. Swing by our other menu plans to find the most updated plan and current sales at Hy-Vee. Whatever method you use, create your shopping list as if you were going to go to the store. OK, so right up front, I think it’s worth mentioning that the feature can be a little hard to find on the website. Have no fear. I’m creating a step-by-step tutorial for you. Saddle up. Here we go. 2. 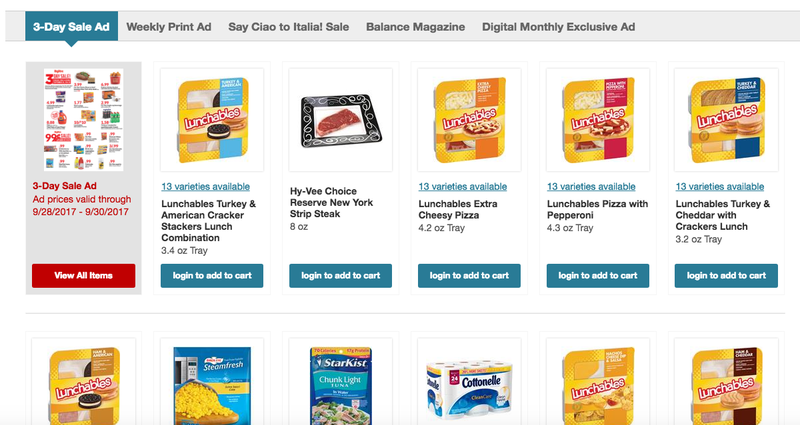 Select “Aisles Online” from the top of the drop down menu. 3. Click the “Login” button at the top right to get started. 4. Create an Account, if you don’t have one. Either search for the products you need or start exploring the “aisles” and adding things to your cart. The website will only feature exactly what is in the store that you are shopping at. I found that the site was very easy to navigate and that the search option worked great on finding the items I was looking for. I also love that it tells you what’s on sale. Here is another added bonus. 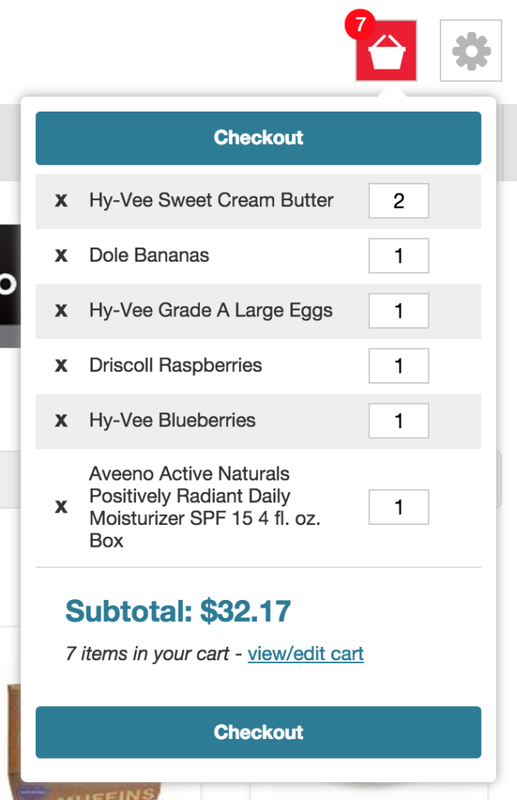 You can look at your cart and see EXACTLY how much you are spending. So if you are on a budget or have spending goals, this makes it very easy. (And yes, as you can see below, I did add face lotion to my grocery shopping list.) 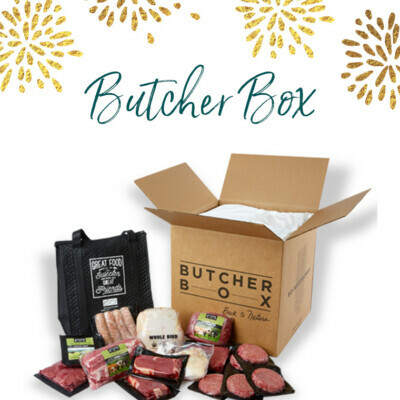 If it’s in the store, you can add it to your list! Once you begin your checkout process, you will clarify delivery or pickup dates and times. 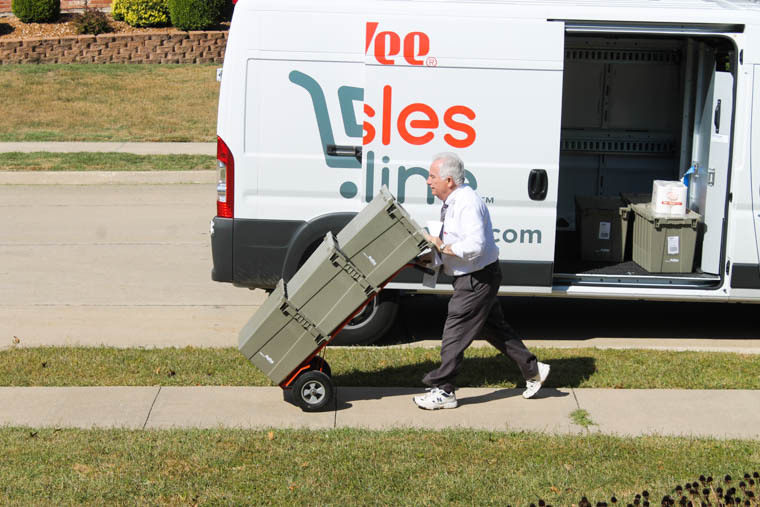 My store delivers anywhere from 9 a.m. until 8 p.m., while some stores only offer pick-up. You simply select a one hour window that you want your groceries to arrive and they will be there! If you do the pick-up option, you’ll just pull your car into a reserved parking spot out front and call the phone # on the parking sign. They will walk your groceries out to your car and help you load. I’m for sure doing this again. And again. And again. They got my order perfect and even had customer service call with a clarifying question before they delivered. I think I for sure saved money by sticking to my list and not impulse buying. Lastly and most importantly, I saved time. 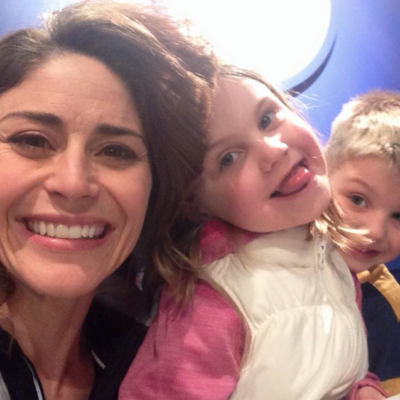 Time that is spent with my family and doing other things that I enjoy rather than power shopping with two kids in tow. Still have more questions? Swing by the FAQ page to get some of the nitty-gritty details. Ready to shop? 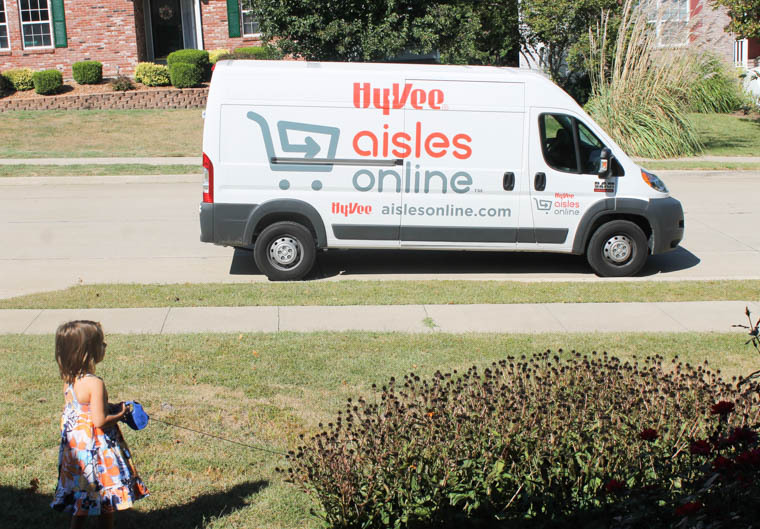 Hop over to HyVee Aisles Online and get shopping! Hi! Can you tell me what you generally tip a hyvee delivery driver? I have scoured the web and asked friends but I am just not finding any good “rule” for what to tip for grocery delivery. It seems that I am tipping several dollars more than many of my friends are… but how do I know what’s appropriate?! Help! This is a good question. I actually talked to the Hy-Vee manager and he said that their company policy is “no tips.” So just know that it’s not expected, first of all. Secondly, I think Polly and I usually tip $3-5. Hope that helps! 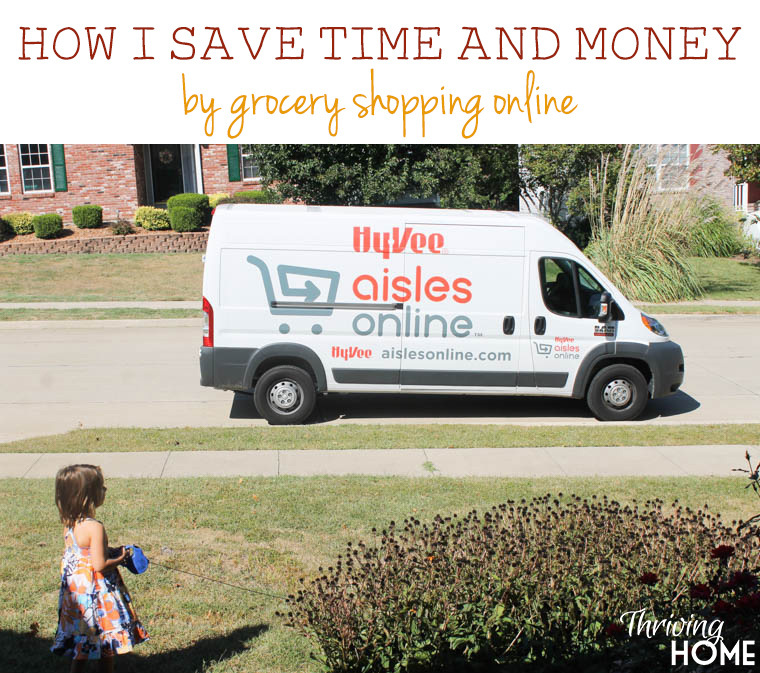 I have been ordering from Hyvee for about 2 yrs now and its a life saver. I tell people about it all of time. Im Disabled and this service is a wonderful help. Its extra helpful on bad weather days since it can be even more dangerous for me to walk with one good leg. Thank you Hyvee for the amazing site, selection, and service. I just wanted to say thank you for sharing this! After reading your blog and review of the process, I tried it out myself this weekend. I picked it up rather than delivering just because of our schedule, but it was so lovely not to drag everyone inside to get all of our groceries! We were able to go take a nice nature walk on a trail to enjoy the beautiful weather instead…much more relaxing for sure. Overall it worked well and this is something I will definitely be taking advantage of again! Thank you! Glad to hear it worked well, Heather! Great video, Polly! Wish we had a HyVee near us! We do have stores near us that offer online shopping and delivery, and I’ve definitely been tempted to try it but skeptical. It’s reassuring to know that they got your order right, It was on time, and the overall experience has been so positive for you. I’m going to give it a try! Thanks! Just visited your new store in New Hope, Mn. last Saturday, with my daughter. Wow! I was not expecting such a beautiful store. Fantastic selection and very friendly employees. I will certainly be a regular customer. Congratulations and best wishes for much success as you continue to expand in the cities. Everyone is talking about you!